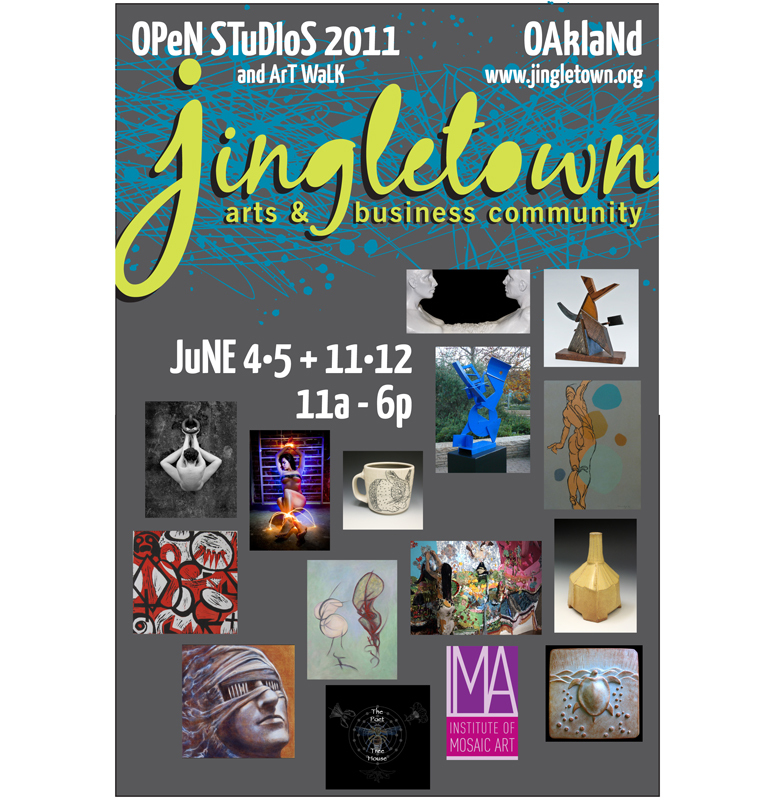 Open Studios 2011 Jingletown Art Walk June 4&5 11&12. The Jingletown Arts & Business Community (JABC) is pleased to announce the East Bay Open Studios Art Walk in Jingletown, Saturday and Sunday, June 4 – 5 and 11 -12, 11 a.m. to 6:00 p.m.
Jingletown Open Studios will highlight the work of artists who live and/or work in the area know as Jingletown. Sandwiched between the 880 freeway and the Oakland Estuary between the Park and Fruitvale Street bridges lies a diverse neighborhood with a storied past. Once a gritty industrial zone that bustled with the activity of canneries, the area is now a rough-hewn gem of light manufacturing, small businesses, residential and working artist studios. For years this migratory landscape has provided the inspiration and, quite literally, the canvas for a wide variety of art, from photography, painting, drawing, printing, ceramics woodworking, metal works, sculpture, furniture and mosaics that adorn a number of local buildings. Now, in homage to a neighborhood that inspires art and the art that inspires a neighborhood, over 15 artists open their studios to the public for the upcoming East Bay Open Studios. Enjoy a casual walk throughout the neighborhood and discover the talent that lies within this neighborhood along the Oakland Estuary and while you’re at it check out the Peterson Art Wall & Garden – colorful murals, mosaic installations and a garden in progress. In a time when our neighborhood is changing dramatically, the goal of the Jingletown Arts and Business Community (JABC) is to heighten awareness about the rich and diverse population of working and exhibiting artists and the creative opportunities in the Jingletown Arts District. Over 15 Artists will open their studios in June for this community event. Photographers, painters, sculptors, jewelers will all be showing art during this Open Studio event.